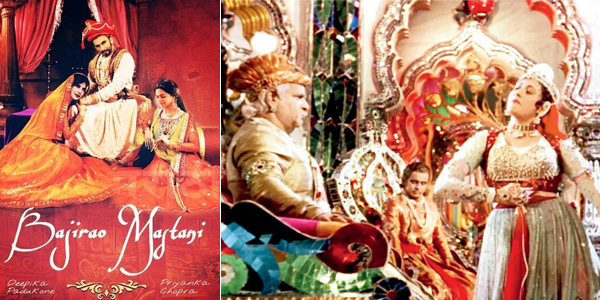 Raaga.com: Is Sanjay Leela Bhansali paying tribute to K.Asif in BAJIRAO MASTANI or bluntly copying MUGHAL-E-AZAM? Is Sanjay Leela Bhansali paying tribute to K.Asif in BAJIRAO MASTANI or bluntly copying MUGHAL-E-AZAM? It seems Sanjay Leela Bhansali is all set to prove his genius over movie legend K.Asif, who produced and directed Indian Cinema’s most iconic and spectacular movie of the century MUGHAL-E-AZAM with his forthcoming film BAJIRAO MASTANI. A close look at Sanjay Leela Bhansali’s BAJIRAO MASTANI and K.Asif’s MUGHAL-E-AZAM, interestingly proves that both movies do share many similarities. Beginning from being period movie’s both the films are based on love stories of two lovers who belong to different class and had opposition from families for their marriage. Both the films took many years into making thanks to both directors Sanjay Leela Bhansali’s and K.Asif’s eye for perfection. Finally both the film’s directors spent money lavishly to give royal look to their films. While K. Asif erected the magnificent and spectacular 'Sheesh Mahal' set likewise Sanjay Leela Bhansali has replicated the eye-catching ‘Aaina Mahal' set. And now the buzz is that like K.Asif’s memorable song Pyar Kiya Toh Darna Kya…. Bhansali’s has similarly shot a song Deewani mastani…. on Deepika Padukone on the extravagant ‘Aaina Mahal' set. What is baffling is that while Sanjay Leela Bhansali is terming his movie as a tribute to the legendary filmmaker K.Asif’s MUGHAL-E-AZAM but surprisingly he is bluntly coping Asif’s MUGHAL-E-AZAM. According to a source close to the movie Sanjay Bhansali has not just copied the idea of 'Sheesh Mahal' but has even shot the song Deewani mastani….frame by frame in the typical K.Asif’s style of filming the song Pyar Kiya Toh Darna Kya…. If readers can recall the song Pyar Kiya Toh Darna Kya….than remember just as Asif shot multiple images of Madhubala glittering on the mirrors of 'Sheesh Mahal' likewise Bhansali has shot Deepika’s images reflecting on the multiple mirror in the 'Aaina Mahal'! Mr. Sanjay Leela Bhansali this is not called paying tribute to a legend but it is termed pure plagiarism!! !